Without creativity peace will never be achieved. Mitchell Joachim, Lara Greden and Javier Arbona from MIT have proposed a house that is actually an ecosystem. 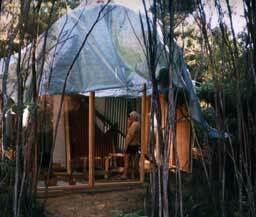 It would be woven from living trees, based on the ancient gardening method known as pleaching. Australian Simon Seasons commented on the Architects for Peace discussion site that the idea was not feasible, complaining that clients would have to wait around for ten years until the hinges for the front door could be attached. He concluded with the thought that "Possibly there is a market for the idea amongst landscape architects? Louis the 15th perhaps." The article on growing houses by growing trees which would then become houses was interesting enough. Perhaps even more interesting was the smug, snide comment by Simon Season explaining why it would not work in his "instant gratification" world. The discrepancy between the two viewpoints not only highlights the reasons why we have wars but also highlights the importance of the creative minds of architects in achieving peace through "a third alternative". I have built a house out of living trees. It took me an hour or two. I simply bent over two rather haphazard lines of trees and tied the tops together to form an arch structure. 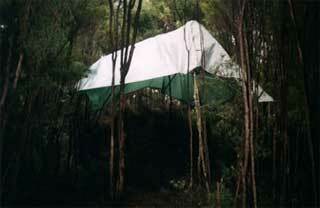 Then I stretched a large tarpaulin over the structure, tied down to the base of the trees. Then I could release the ties so that the trees sprang up as far as they could to make everything wonderfully taught. The design process took even less time than the building. Because I did not need to cut any trees the structure was completely reversible, so that all those complicated ethical questions about environmental damage could be avoided. To my amazement the result was exquisitely beautiful. The dappled light and dancing shadows left me entranced. I say "amazement" because I did not set out to build something beautiful and I did not expect the result to delight my soul. All that was a bonus. The brief for the structure was very simple. It takes an hour to walk from the nearest road to the site I have chosen for a house. Everything has to be carried in. In a situation like this all those high ideals about touching the earth lightly become simple practical realities. By the time the sun went down at the end of the first day the few materials I had carried in were securely stored, some good coffee was brewing, and I had somewhere to sleep. The creative process is just that. Creativity never arrives. It goes on discovering. The architecturally designed house proposed for the site never did get built, and as a result there is a grassy knoll where you can now sit in the sun. By the time the chrysalis of the tarpaulin finally disintegrated, destroyed by wind and ultraviolet light, another house was revealed, which had slowly been growing beneath it. It did take four years before there was somewhere to put hinges to hang a door, but it also took that long to reach the conclusion that doors are not such a good idea. Doors keep people out. In contrast it only took a day or two to put down a welcoming doormat with a completely different message. If you need privacy you can turn the doormat over. Friends understand. Architects dream about what might be, and that leaves them open to the unexpected possibility. Every building worth building is ongoing research. Universities which decide that research means writing a book about what someone else has discovered are spiralling downhill into ecological collapse. The "climate change war" will finally be fought to defend a position lacking in credibility. Architects have a unique contribution to make to peace. Their restless creativity moves them away from polarised alternatives to a world which no one could have envisaged. It is the fun of the journey which leaves them wondering that if we have too many doors, too many hinges, and too many things to worry about, we might ask again if the real sustainability question is that we simply have too much building.